To document in writing is a direct way to preserve a thought, legitimize a concept or make an idea concrete. 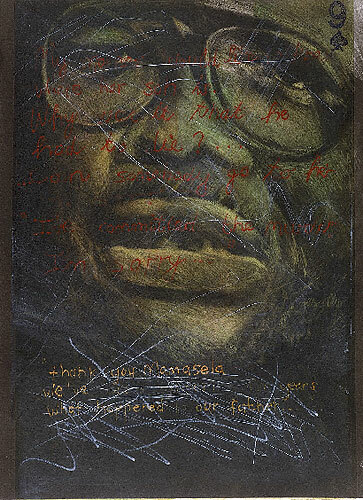 African artists often use inscription to detail the discrepancies and ironies of colonial narratives of conquest and to explore how writing has dictated the telling of Africa's histories. They incorporate the language of visual forms to create works that express and often contest the dynamics of power, control and social relationships. Such powerful narratives challenge established structures of authority, shape public perceptions and assert identity. 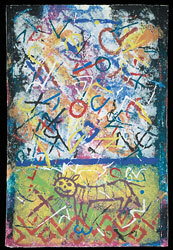 Many urban artists draw on their print-saturated environments for inspiration. They incorporate texts and subject matter from newspaper and television accounts of current events, recognizing the power of the media to mold public opinion. Others turn to posters and graffiti as a way to stake a public claim to ideas and issues, much as urban graffiti arts take over public spaces. With the global information revolution, computer technology has opened a new chapter in the creative interplay of word and image for many African artists. Now director of the Artist Proof Studio in Newtown, Johannesburg, Kim Berman obtained her bachelor of fine arts degree from the University of the Witwatersrand and a master of fine arts degree from Tufts University. 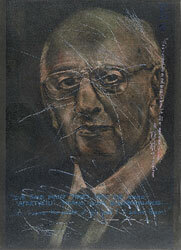 She taught at the Museum School of Fine Arts, Boston, from 1988 until 1992. 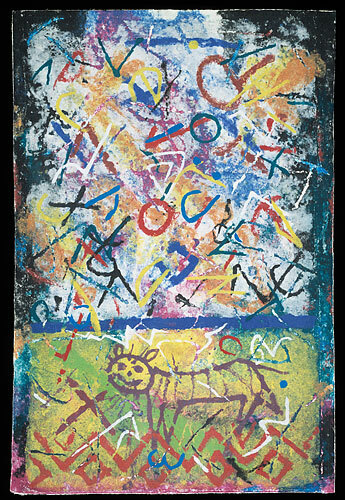 Berman returned to South Africa in 1991 to undertake collaborative printmaking projects, and she is now a senior lecturer in printmaking in the fine arts department of the University of the Witwatersrand Technikon. To create the colorful motifs that enliven this work, Durant Sihlali applied dyed paper pulp with a brush or tool, then pressed the pulp with a roller onto the surface of handmade paper. The marks, circles and Xs that layer this work echo scripts found on urban walls in South Africa. For the artist, such walls are a form of urban literature chronicling local histories. The Xs also refer to the marks placed on temporary dwellings or informal structures that government forces have designated for destruction. 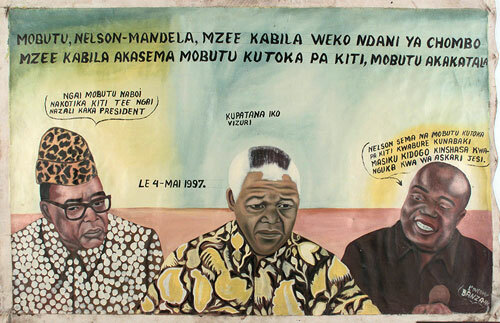 In this painting, Nelson Mandela, South African president from 1994 to 1999, is flanked by Congolese president Mobutu Sese Seko and his political rival, Lawrence Kabila. The written captions present Mandela's dilemma as arbiter; namely, how to ensure cooperation in an orderly transfer of power from one Congolese leader (Mobutu) to another (Kabila) in 1997. The lead caption in Swahili identifies the issue: "Mobutu, Nelson Mandela, [and] Mr. Kabila are inside a dhow [sailing vessel]; Mr. Kabila says Mobutu [should] leave the seat of power, Mobutu refuses." 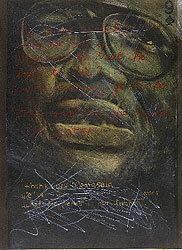 Mobutu's caption, in Lingala (the language of the army), expresses his reluctance to give up the presidency. Kabila states in Swahili, "Nelson says if Mobutu leaves the seat of power open, in a few days Kinshasa falls at the hands of the army." As mediator, Mandela's Swahili caption emphasizes, "To share [cooperate] is good." H x W x D: 39.2 x 60.2 x 3.5 in. 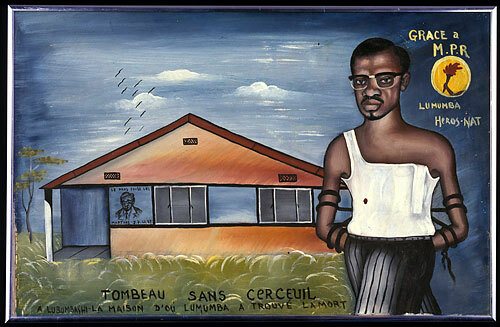 The text, in French, translates: "Tomb without coffin: in Lubumbashi, the house where Lumumba found death" and "Thanks to the M.P.R. Lumumba [is] a national hero."